Jonathan Overend, the BBC’s tennis correspondent for the last 10 years, will be bringing out “Daddy’s big suitcase” just a couple more times, after the former SJA Sports Broadcaster of the Year accepted a new role with Radio 5Live that will see him doing more sport and news presenting, but importantly will allow him to be based closer to his Newbury home and his young family. “I have spent 10 years attempting to do one of the best jobs in British sports journalism, covering a golden era of the sport in some of the most glamorous cities in the world, so I give it up with a heavy heart and great sadness about the people, places, matches and stories I am leaving,” Overend told sportsjournalists.co.uk. Overend’s spell as tennis correspondent has two Grand Slams left – Paris and then, next month, he will commentate on Wimbledon. 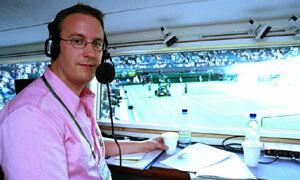 Aged 40, he has worked for the BBC for 20 years, having succeeded Iain Carter on tennis in 2002. Since then, Overend has commentated on all 17 of Roger Federer’s Grand Slams, all seven of Rafa Nadal’s French Opens and Andy Murray’s debut major at the US Open last year. His move was flagged up earlier this week, when the BBC took the highly unusual step of advertising externally for a replacement for such a plum role – senior on-air broadcast positions are rarely, if ever, advertised in such a manner. Overend will undertake more presenting work for Radio 5Live, probably covering football more often, the staple of any sportsdesk, and he will report on a wide range of Olympic sports. “I am incredibly excited about covering a wider variety of sports as presenter, commentator and reporter,” he said. “My passion for the Olympic Games hopefully came across during our coverage of London 2012 and having championed taekwondo last summer – one of the big ‘hits’ of our Sony Award-winning coverage on 5Live – I’m planning to return to the sport to cover the world championships this July.” So the “big suitcase” won’t have been put away altogether. “This will be the first of many assignments at major Olympic sport events where I hope my all-sport passion will help raise the profile of so-called minority sports even further. The move has not been described as such, but sounds very much like a promotion to a higher profile role on the rolling news channel. “As for my successor, I wish him or her the best possible time in one of the best possible jobs and will continue to support Andy Murray, Laura Robson and Heather Watson from a distance. They have all been great to work with and I shall certainly miss them,” Overend said.